U Yad Vashemu je otvorena značajna i jedinstvena izložba "Flashes of Memory: Photography during the Holocaust" kojom je prilikom publicirana i posebna knjiga. Dr. Alexandru Avram, direktor "Hall of names" , tu je knjigu u ime Yad Vashema uručio dr. Meliti Švob u znak priznanja i zahvalnosti za njen rad i suradnju. Dr.Avram je posjetio Zagreb i sudjelovao na "Opatiji 2018" , koju je organizirala Udruga preživjelih holokausta u Hrvatskoj. Different agencies photographed during the Holocaust. For the Nazi German regime, photography and film-making played a crucial role in propaganda as a means of expression and a tool for manipulating and mobilizing the masses. This kind of documentation attests to Nazi ideology and how German leaders sought to mold their image in the public eye. 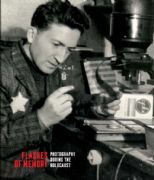 Conversely, Jewish photography was a component in the struggle for survival of the Jews imprisoned in the ghettos, and a manifestation of underground activity that testified to their desire to document and transmit information on the tragedy befalling their people. The Allied armies, who understood the informational value of photographing the camps they liberated, documented the scenes revealed to them, bringing in official photographers and encouraging soldiers to commemorate the Nazi horrors as evidence for future war crimes trials and in an effort to re-educate the German population. This exhibit presents a critical examination of documentation through the camera lens, focusing on the circumstances of the photograph and the worldview of the photographer, while referring to the Jewish photographers’ different and unique viewpoints as direct victims of the Holocaust. All items on display are replicas of the originals.